Bordeaux, Musée, La Femme et l’artiste (1964), cat. 97. Paris, Galerie Bernheim Jeune, Exposition au profit de la Maison nationale des Artistes à Nogent, n.d. [c. 1964] (as Watteau, lent by a private collector, Geneva). Mathey,“La Comédienne,” Connoisseur (1967), 90-93. Macchia and Montagni, L’opera completa di Watteau (1968), cat. 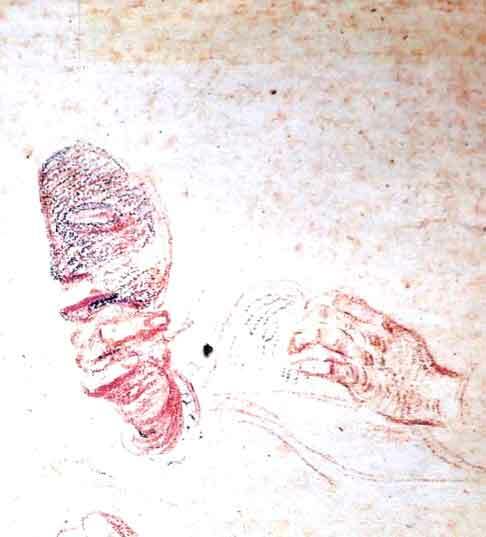 3o-C.
Watteau, Sheet with Studies of Heads and Hands (detail), red, black, and white chalk. Whereabouts unknown. When Mathey published La Comédienne, he proposed several comparisons between the picture and established Watteau drawings. But, for the greater part, they remain just analogies; they are not studies that the artist actually used for his painting. The major exception is a splendid trois crayons sheet of heads and hands (Rosenberg Prat 456). 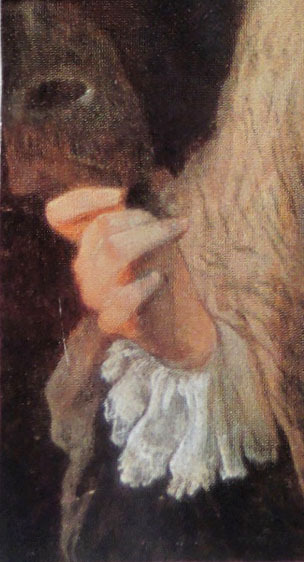 The study at the upper right of a hand holding a mask corresponds closely to the actress’ right hand and mask, and thus constitutes evidence of Watteau’s authorship of the painting. Curiously, Rosenberg and Prat, normally fastidious in such matters, made no reference to the Mathey publication of the drawing or the actress’ hand in La Comédienne. Watteau, Sheet with Four Studies of a Woman’s Head (detail), red, black, and white chalk. London, British Museum. 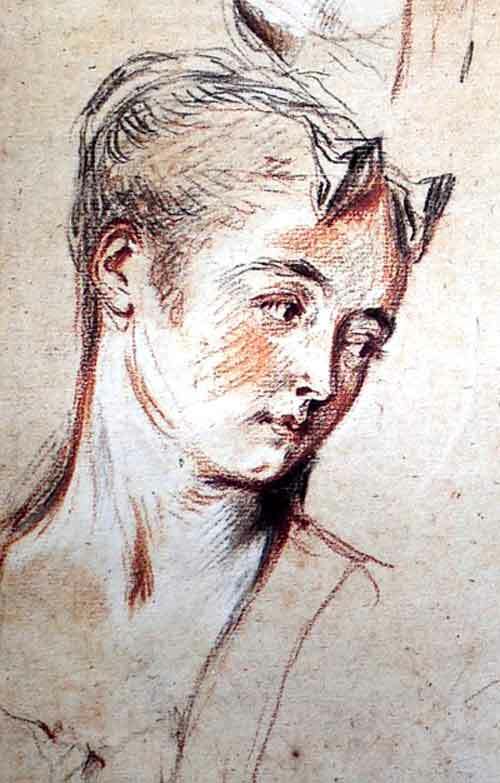 Watteau, Study of a Woman’s Head, red and black chalk, 15.5 x 7.3 cm. Whereabouts unknown. 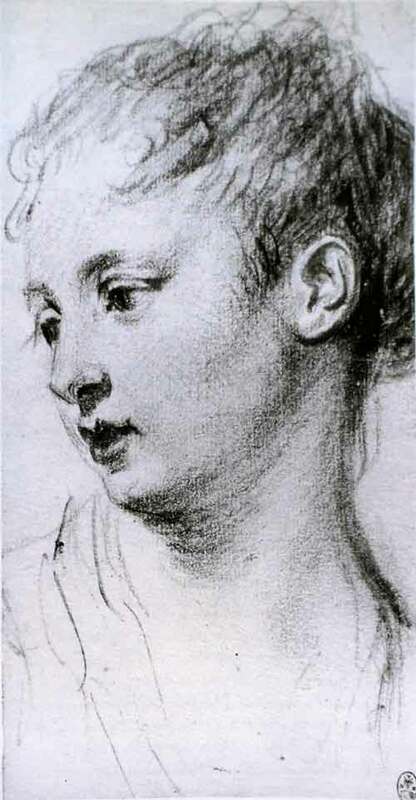 Among the other Watteau drawings that Mathey summoned up is a study of a woman’s head in a well-known drawing now in the British Museum (Rosenberg Prat 521). Indeed, the round eyes, snub-nose, and pursed lips of this sensitive rendering recall in a general way the painted features of La Comédienne. But other of his drawings share these same characteristics, such an evocative drawing of a woman’s head that was undoubtedly cut from a once larger sheet (Rosenberg Prat 439). Clearly, the exact drawing that Watteau employed for La Comédienne is yet to be found. This portrayal of an actress singing and posturing strikes an unusual note in Watteau’s oeuvre, largely because it is an unfamiliar work. Yet it fits comfortably among Watteau’s later works: large in scale, rich in color, warm in character. Her distinctive costume—the puffed, slashed sleeves, the beribboned scarf, the coquettish cap and plume—situate her in the world of the theater. Her lips are pursed as though she is singing, and the turn of her body and the mask in her hand further the allusion. 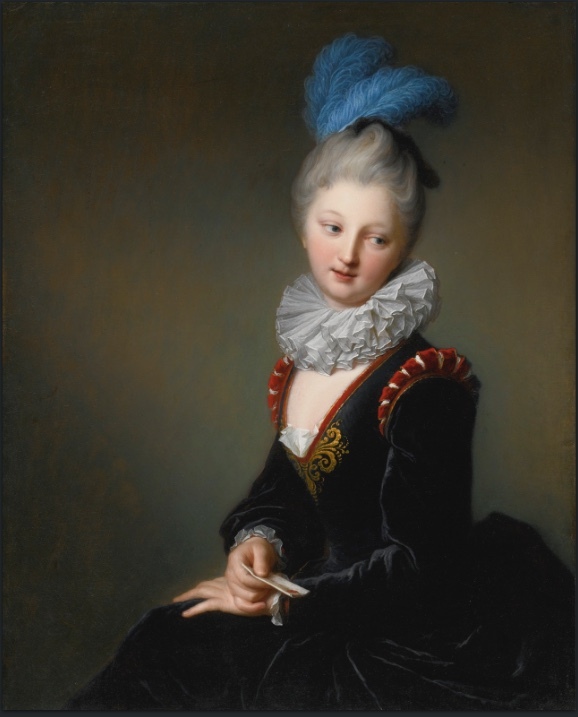 This painting is unfamiliar, in part, because it was not known to scholars until after World War II when it was first presented publicly in Paris and Bordeaux. Mathey’s publication of the picture in Connoisseur should certainly have established its place in Watteau scholarship, but except for Macchia and Montagni’s rejection of the work, subsequent critics have shunned even a mention of it. Roland Michel, Posner, Rosenberg and Prat, Temperini, and Glorieux have passed over it in silence. One might wonder if Mathey’s publication perhaps damaged the painting’s standing rather than strengthening it, especially since so many of his attributions proved obviously incorrect or false. Jean-Baptiste Santerre (attributed to), Portrait of an Actress, 91 x 73 cm, Private collection. 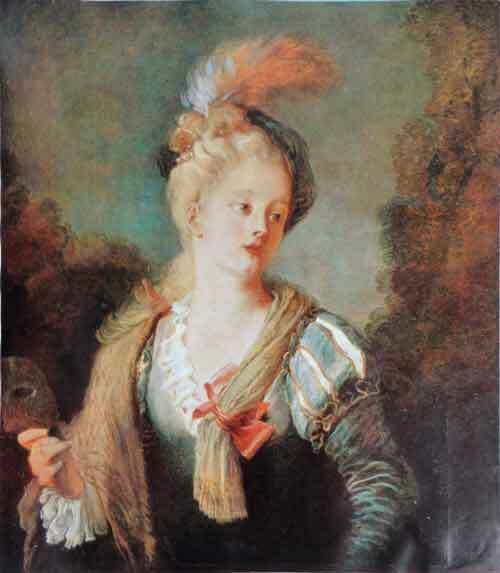 Jean Honoré Fragonard, Marie Anne Éléonore de Grave, 81.5 x 65 cm, Paris, Musée du Louvre. Macchia and Montagni, the only critics to outrightly question the attribution of La Comédienne to Watteau, thought that the painting was executed after Watteau’s lifetime. But how much later? 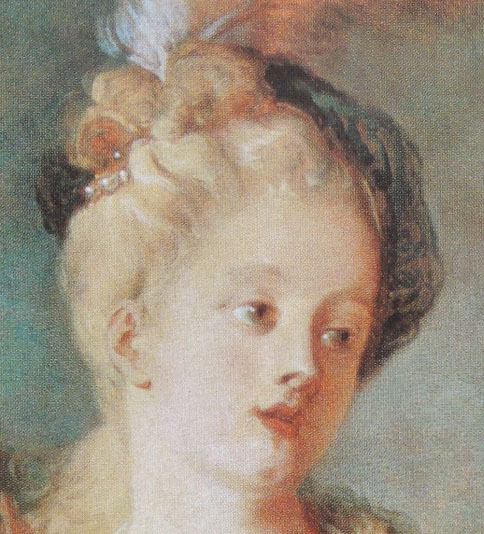 While in some ways it anticipates Fragonard’s Têtes de fantaisie, such as the Portrait of Marie Anne Éléonore de Grave in the Louvre, I believe its links to Watteau’s oeuvre are far stronger. Not only the facial features of the type that Watteau favored, but also the russet trees in the background also relates to Watteau’s oeuvre. It is more profitable to consider paintings by Watteau’s contemporaries, such as the Portrait of an Actress, perhaps portraying Antoinette Charlotte Desmares, by Jean-Baptiste Santerre (1651-1717). 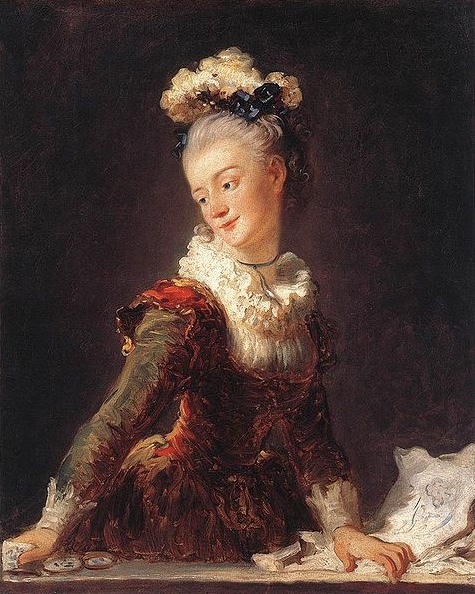 While Santerre and Watteau had distinctly different styles, nonetheless they are closely related in the evolution of French portrait and genre painting in the eighteenth century, the same tradition that later produced Fragonard’s Têtes de fantaisie. It is significant that at least two copies of this painting survive. As the original was not engraved, these copies must have been made from the original, indicating that the picture once enjoyed some celebrity.